Turn to the Anolon Advanced Bronze Hard-Anodized Nonstick 3-1/2-Quart Covered Chef's Casserole for a pot that is as user-friendly and functional as it is elegant. This covered casserole is ideal for keeping soups and stews on a low simmer and for dishes like braises that start on the stovetop and finish in the oven. 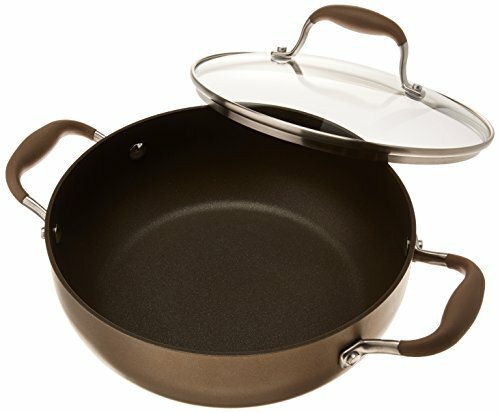 The heavy-duty hard-anodized construction provides efficient, even heat distribution that helps to reduce hot spots that can burn foods and coupled with its sophisticated palette -- a warm bronze exterior and a chocolate interior -- this casserole provides an exceptional gourmet cooking experience. DuPont's rugged Autograph 2 nonstick surface inside provides superior food release for easy cleanup, even when baking cheesy potatoes au gratin. Oven safe to 400 degrees Fahrenheit, this casserole also boasts revolutionary Anolon Sure Grip handles that are dual riveted for strength and feature rubber over stainless steel for a comfortable, confident grasp. And, the shatter-resistant glass lid allows easy monitoring of food while it cooks without losing heat or moisture. A great addition to every kitchen, this covered casserole coordinates well with other pieces in the Anolon Advanced Bronze collection. Enjoy optimum performance and sleek design with the Anolon Advanced Bronze Hard-Anodized Nonstick 3-1/2-Quart Covered Chef's Casserole.